Growing up poor can have a major effect on a person’s fiscal outlook. I was raised, for part of my childhood, by a single mother. We never had much. In fact, my mom often said, “we don’t have much, but at least we have love.” Truthfully, I suspect she said this, in large part, to ease her pain and depression. I didn’t know what it was called as a kid, but I did know that my mom wasn’t exactly the same at the beginning of the month as she was after about the first week. She went from being carefree and fun to sad, and the sadness lasted until the 1st. Of course, as the month pressed on she would begin to worry more and more, and though I didn’t know what anxiety was, I felt the tension. I still remember living month by month, waiting for the 1st to come like a glorious life-vest in a sea of poverty. Then came the 1st! Hurray! Mom snapped back to, and life was enjoyable again. We had made it through. It was time to celebrate. And boy did we celebrate. It was like a birthday party. We’d go out to eat. My mom would buy us toys and candy. It was a brief joyous time before reality set back in that we were poor, and really couldn’t afford to live like others we knew. Reflecting on it now I can see that this way of handling money is not responsible, but I can also see how month after month she rationalized celebrating. The truth is that being poor and on public assistance changes how you think about money. After a while, you start to live for the next payday, and tend to spend wildly to make up for the rest of the month. And just like that we would go from “just like everyone else” to “that poor family” over and again every month. We never got ahead. In fact, I remember time and again hearing my mom, and later my step-dad, plead for leniency on rent or bills because we simply didn’t have the money. Years like this wore on my mom, and conditioned the whole family to think of money as the cure-all that we would never have enough of, but at least when we did have some we would enjoy it as much as possible. Naturally that’s not a healthy relationship with money, but it is the reality of many families across the US, and it is this exact type of upbringing that traps some families in a loop of generational poverty. When I think about the way my mom handled our family’s finances I can see more at play than simply the anxiety and depression that were caused by her circumstances. It seems there was a sense of entitlement, one that she wasn’t even aware of, mingled with a sense of rugged individualism that played into how she handled money. It is strange to think back on how my mom, and many others like her, began to expect the check as something due our family, and not so much as charity. On the other hand, I remember times when charity was turned down as it was seen as an affront to our family’s pride to accept help. It really is a unique mindset. Our family prided itself on making it through on government assistance, without special help from others. Of course, poverty didn’t change my outlook on money, instead it shaped it from the very beginning. I’m grown now, and my relationship to money is quite a bit different, but that old thinking still creeps in from time to time, which is something I plan on writing about in a future post. 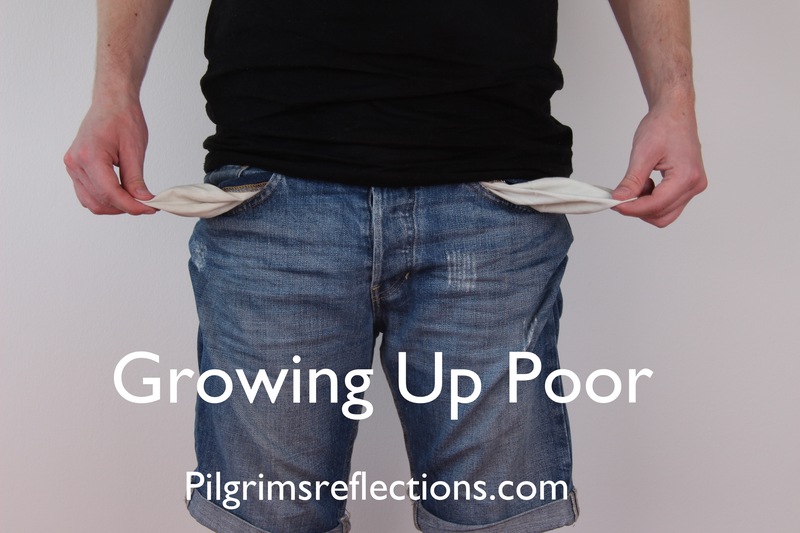 My purpose in writing this post is to give something of a glimpse into what it was like growing up poor, and how that shaped my early thoughts on money. It made me fear not having it, and rejoice by spending all of it when it came. For me, this is what it was to grow up poor.